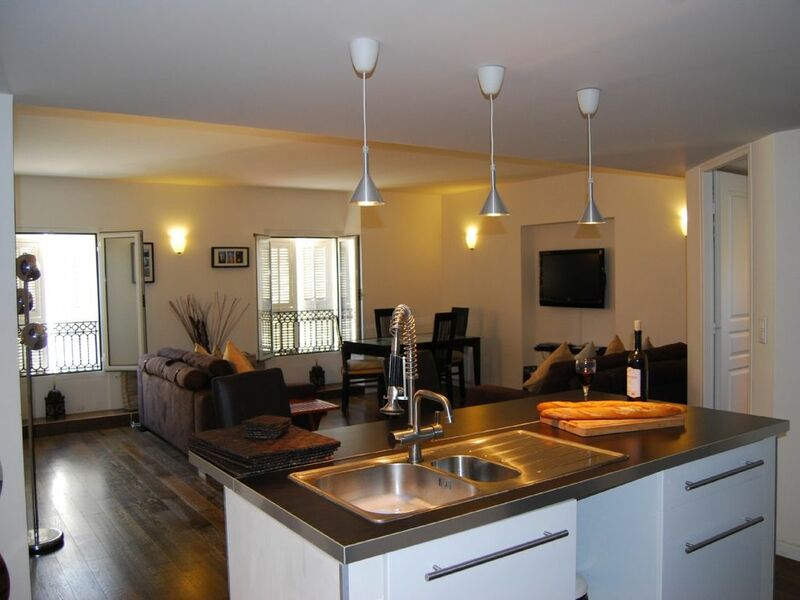 Modern airy apartment on Boulevard Victor Hugo central Nice. A newly restored(60m2) 1 bed apartment located on the beautiful Boulevard Victor Hugo this leafy avenue in the very centre of Nice is only 4 blocks (approx 8 min ) from the beach situated on the fourth floor of a typical Nicoise building which unusually for a building like this has a lift to all floors the apartment is west facing and is rewarded with afternoon and evening sun .It has been renovated to a high standard with modern kitchen appliances and designer furniture and well chosen fabrics making this apartment light and modern.The sitting room contains two double high quality and very comfortable sofa beds with a large flat screen HDTV , dining table and chairs off of the lounge is the double bedroom which contains two single beds which can be separate or fixed together to make a double as you choose. Also off the lounge is a fantastic shower room with a walk in shower tiled floors and a modern stone sink. Had no option but to sleep on the same sheets for over 2 weeks! I wrote to the owner listing my various problems and he answered me in a very confrontational manner, I cannot recommend this flat! And he did not refund me for the unused portion of my stay. After 3 days you e mailed to say all was well in the apartment but you couldn't get the dryer to work ,i explained that it was a washing machine not a washer dryer and that there was a clothes airier in the cupboard on which the wet washing could be aired or the heated towel rail in the bathroom . I went on to explain that if you did have any operational problems as we were uk based it was far better if you contacted my agent in Nice who could solve any minor issues quickly by phone or if necessary visit to overcome any problems. The heating is provided by the reversible air-conditioning which in the winter and spring is set at 28c once switched on it will take a minute to start blowing warm air but after that heats the apartment extremely efficiently again this was explained by my agent . The apartment block is a typical French residential block the TV channels are in French however there is a DVD player with a selection of English DVDs should an evening relaxing be the desire , the corridor lighting has the power saving light switches which need pressing when the lights go out rather than potentially movement sensitive lighting which you may be more used too. Stayed in this apartment last year. Great location, short walk to the station (which gives you easy access to Monaco, Eze, Ville France, Antibe to name just a few). Short walk to beach. Lots of lovely restaurants in both old and new town. Good local shops nearby if want to cook in. Stayed in this spacious one bedroom flat for 5 days. its modern design has nice touches, huge comfy bed and plenty of kitchen appliances and condiments gave it a homely feel. Although situated in nice leafy area, It has no much views. Access: its on the 4th floor with steps to the lift, fine for fitter people. Location: good foe exploring the whole town, 7 min walk down the sea, 10 min to place Messena and old town.There was a very good local support service, small hiccups were promptly resolved. Overall enjoyable stay. Posizione centrale e tranquilla, proprietario cortese, tutti i servizi nelle vicinanze, appartamento conforme a quanto descritto nell' annuncio, pochi passi e si arriva al centro della vita ottura, perfetto, consigliato. We loved this apartment which was beautifully decorated in a modern style that we'd have chosen ourselves. Very clean with great shower and comfy bed. Its in an ideal location - quiet at night whilst being within easy walking distance of all the main places including the pedestrianised area with lots of bars & restaurants, shops, beach and train station. There really is something for everyone. We took the train to Monaco for a day which is a must whether you're a Grand Prix fan or just like to watch how 'the other half live'. Communication and organisation of key uplift etc with the owner was excellent and we would definitely stay here again if we return to Nice. We'd have no hesitation in recommending the apartment to family and friends.